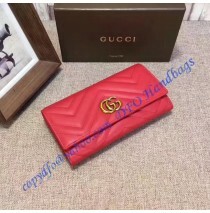 Gucci makes some of the best wallets we are able to see on the market today. This Gucci GG Marmont Continental Wallet with a cubic pattern is certainly one of them. Let’s begin with the design. It is made of black, mateless leather which not only looks great but is durable at the same time. 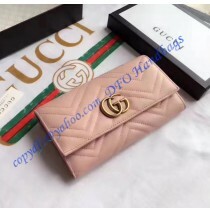 Then we have a massive GG logo which makes the entire wallet look even better and of course, it reveals to all people around you that you have a Gucci fashion statement. Interior is special as well. Not only you get 12 credit card slots but you will also have 2 additional pockets and a zipper compartment for coins. As you can see, space won’t be an issue here. Even women who have a need for carrying plenty of credit cards, bills, and cash will be able to meet their requirements with this wallet. 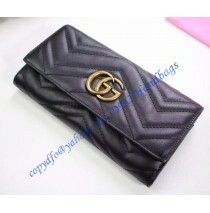 Still, the looks of the wallet is something that will attract you. 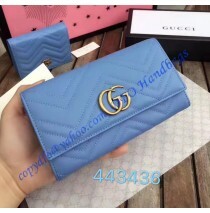 There is no similar nor the same wallets on the market, therefore you are certain that you will own something unique and completely different. Gold hardware makes this even more obvious. It is designed to be durable and to stay like new for a long period of time. Let’s not forget to reveal that the wallet comes with a snap closure. It isn’t as safe as a zipper closure, but it is much more practical and easier to use. Using the wallet is therefore much better than you may believe. 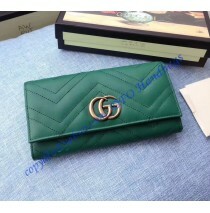 Gucci GG Marmont continental wallet looks great and offers all the advantages Gucci fashion statements must provide. As such, we can only say that this wallet is something you must own as soon as possible. After all, it comes with a GG logo.